China is now recognized as a hub of Western music activities. What led to the transculturation of the nation’s musical soundscape? Was it solely the result of colonialism and Western cultural hegemony? Who were the actors in the transculturation process? This paper investigates Western music performances by Chinese musicians Ding Shande, Wu Leyi, Lang Yuxiu, and Gao Zhilan, who were students of the National Conservatory of Music in Shanghai and became leading musical figures of the PRC after 1949. Drawing on archival sources such as concert programs, newspaper clippings, and musicians’ memoirs, this study traces the early concerts of Chinese musicians and their reception. It argues that these concerts not only put these musicians onto stardom, but also shaped musical development in China in the second half of the twentieth century. After all, in semi-colonial Shanghai, Western music performed colonial cosmopolitanism and thus became an agent of reformist, revolutionary, and nationalistic ideals on the part of Chinese musicians. In this regard, music performance then and now is not only a form of entertainment but also a negotiation between the powerful and the powerless, the colonizer and the colonized, and the government and the governed. Hon-Lun Helan Yang is Professor of Music at Hong Kong Baptist University. 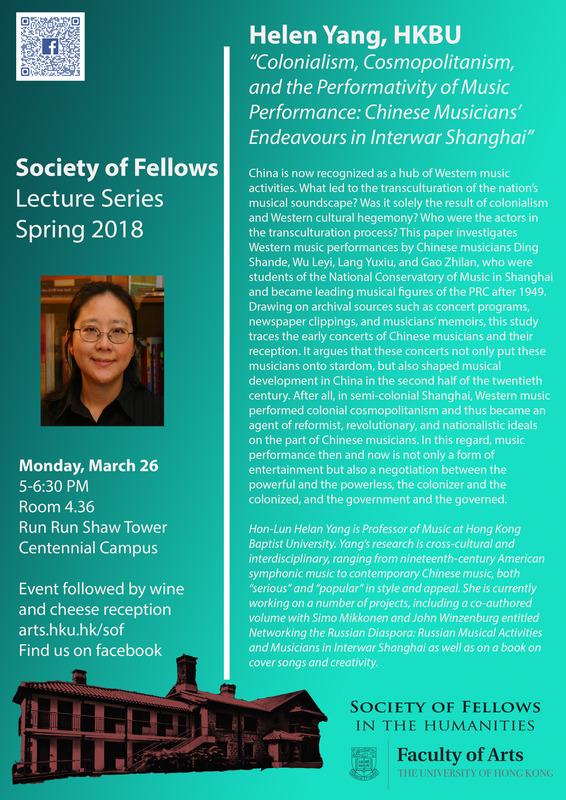 Yang’s research is cross-cultural and interdisciplinary, ranging from nineteenth-century American symphonic music to contemporary Chinese music, both “serious” and “popular” in style and appeal. She is currently working on a number of projects, including a co-authored volume with Simo Mikkonen and John Winzenburg entitled Networking the Russian Diaspora: Russian Musical Activities and Musicians in Interwar Shanghai as well as on a book on cover songs and creativity.